When installed in conjunction with the FAKRO ZWMP Weather Module, the FAKRO ZWD Wind Sensor is a convenient device that's designed to detect extreme wind changes. When mounted on a rooftop area, it can record wind speeds and notify any Z-Wave compatible windows to close upon reaching high speeds. When unpredictable weather changes occur, the FAKRO ZWD Wind Sensor system can automatically close windows to protect your home. 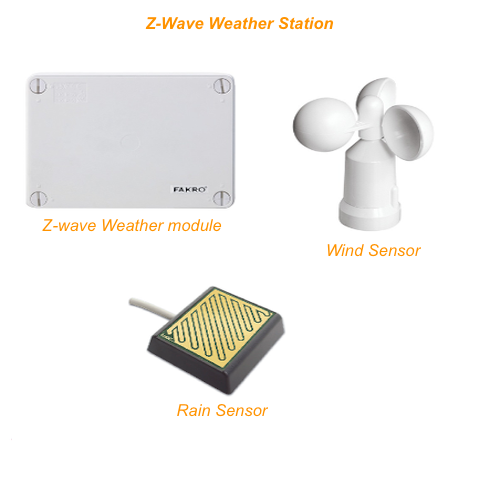 When installed with the FAKRO Z-Wave ZWMP Weather Module, the Wind Sensor can be used to detect wind speeds and communicate with any Z-Wave compliant window installations when the wind threshold has been reached. Upon detecting high levels of wind, the Wind Sensor will communicate via radio frequency and close any associated motorized windows around the home. Through smart inclusion with your home's existing Z-Wave Network, the Wind Sensor can easily be installed alongside other automated devices in order to work together.